Melania Trump resumes her holiday vacation as she flies back to Florida to spend time with her son Barron Trump in Mar-a-Lago. The FLOTUS is said to have traveled alone on Thursday since Donald Trump needs to remain in the White House to solve the partial government shutdown that started last Friday. Melania Trump and her husband Donald originally planned to fly to Mar-a-Lago to celebrate Christmas with the whole family, including the POTUS’ older children and their respective families. They were supposed to have a 16-day holiday break but this was canceled due to the unexpected chaos in the White House. 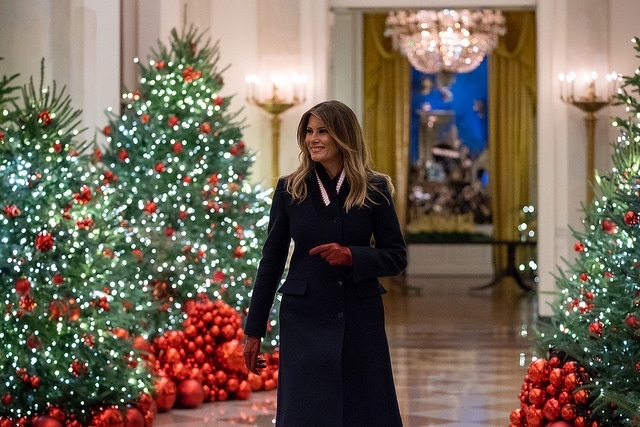 The First Lady originally went ahead with their Christmas plans and flew to Mar-a-Lago on Dec. 22 without Donald Trump who remained in Washington as the government shutdown looms. However, the next day, she flew back to the White House to be with her husband. They spent Christmas together despite the FLOTUS complaining that he is all alone at the most festive time of the year. Now, on the evening of Dec. 27, it was reported that Melania Trump is back to Florida minus her husband. It is not clear if the FLOTUS will be in Mar-a-Lago on New Year’s or she will celebrate the day with Donald Trump in Washington. Meanwhile, it was already announced that President Donald Trump is also skipping the New Year celebration with his family. The POTUS canceled his holiday plans because as mentioned before, the government has partially shut down.